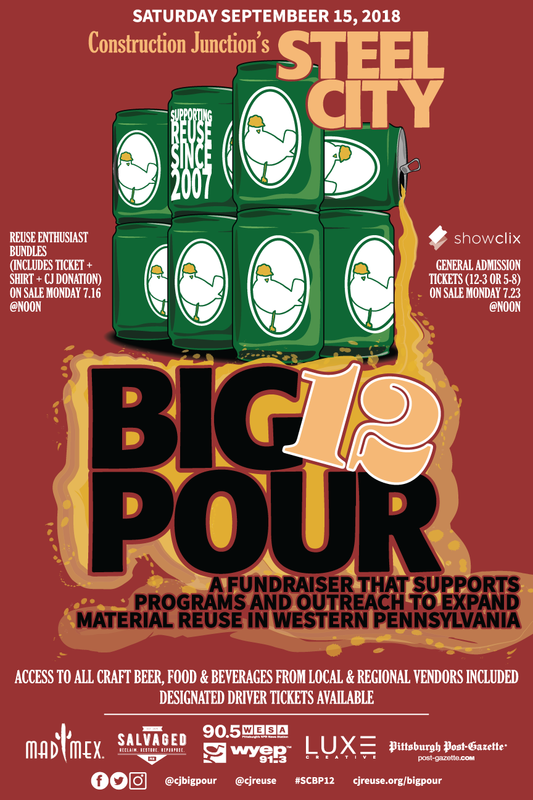 The Steel City Big Pour helps to support Construction Junction’s mission of reuse and conservation by raising much needed funding to expand programs like job training, community outreach, & more. Enjoy one of the largest beer & food selections of any event in the Pittsburgh area. Live art, music, raffles, & more. General Admission price includes: Taster Glass, Brew Caddy, Big Pour App available for download and all fees & taxes (except mobile delivery, if selected). Additional Purchase Options: A Big Pour t-shirt, available in either black or gray and will be mailed directly to you just in time to wear on the big day (no in-store pickup available). A limited supply of shirts will be available the day of the event – ORDER YOUR SHIRT with your ticket purchase. * Must be 21 or over to attend… including all designated drivers! * ID required. No children… no one under 21 admitted.